Since 1987, the porcelain, carpet, and sportswear industries have made use of his design work. He purchased a mill in 1988 which he uses as a center for graphic printing (serigraphy and etching), thereby expanding his artistic scope. As a result of international recognition, distribution points and studios were established in London and Connecticut in 1990. During his travels, Gockel had the pleasure of meeting Salvador Dalí and Joan Miró, great sources of artistic inspiration. He is also inspired by Kandinsky, Chagall, and Picasso, and he can’t forget the works of Jasper Johns and Jackson Pollock. From his humble beginnings, Gockel has become one of the most prolific distributors of modern art lithographs and serigraphs in the world. With expressive use of rich, primary colors, Gockel has created an exceptional style that is undeniably unique. “Art both influences culture and imitates it,” Gockel has said. “I am influenced by the colors, symbols, textures, fibers, and designs used by different cultures around the world.” His fluid strokes on large white canvas backgrounds, done in the manner of “action painting”, have a tremendous universal appeal. Since 1983, more than one hundred million open-editions of his work have been sold internationally, including serigraphs and other limited edition graphic works. 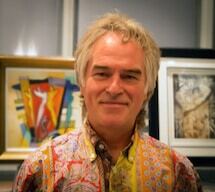 In 2008, he founded the art group Quadriga, producing woodcut and linoleum etchings and lithographs. Over the last decade, Gockel has enjoyed producing sculptures in bronze, silver alloy, acrylic, aluminum, and steel, participating in expositions in New York, Boston, Dublin, Madrid, Cannes, Essen, Karlsruhe, Duisburg, Bern, Athens, Innsbrück, Salzburg, Lisbon, Belgium and The Netherlands. Today, Gockel continues to participate in exhibitions and live painting performances in USA, Germany, The Netherlands, Belgium, Ireland and France. Always active, in his “spare time” Gockel plays tennis, walks in the German forests with his two dogs, or rides Harley Davidson motorcycles with his wife. They enjoy spending time at their favorite spot at the island Sylt.